There was a bear on the sidewalk that I passed everyday while walking to and from school. I never had the guts to pick it up. I know it sounds weird, but when you live in a family of germaphobes, you are kinda forced to be cautious. Anyway, one day, I heard a noise coming from the bear, It was a scream! Or maybe just a shout. Fine it was a whisper. I miss you. It said. I had a flashback, I was hugging the bear with all my strength when I was four. I picked it up and smiled. Well done on your story this week Maya. It liked that you were re-united with your bear in the end. It's lucky that he was there all that time! Habitat: Pegasi don't usually have any real habitat because of the dangers. Pegasi roam free of misery and stop when needed. Appearance: Pegasi are very much like horses in every way except they have wings. 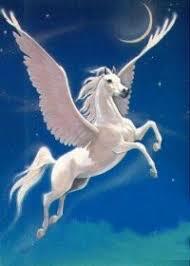 They can be white or grey most of the time because no one has ever really seen a Pegasus except when they imagine it. Question: Do you believe in magic? Maya was born on April 24, 2008 in Lansing, Michigan. She enjoys violin, poetry, reading, eating and sleeping. 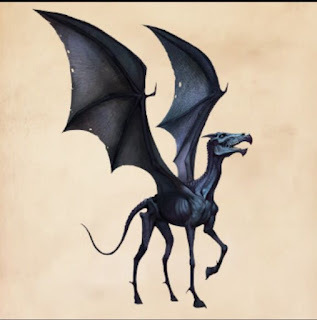 Her passion is to learn about magical creatures and that is why she created this blog. The authors that inspire her are J.K. Rowling and Mary Downing Hahn. her parents are Ellen Adamo and Shantanu Chakrabartty, she has a fish named prism and the memory of two cats, Chester and Cleo. character:Thestrals are social creatures who live in herds. ProfessorRubeus Hagrid states that they are "dead clever". In fact trained Thestrals are smart enough to understand their rider's words when they ask to travel to a specific location.